The smokiness of the tomato perfectly complements the sweetness of the glaze with this premium cut of beef. Season the steaks with the oil, salt and pepper. Cook until desired level is reached. Place the mushrooms in a large roasting pan, add 100 ml of the oil and cook until soft. Add the remainder of oil to the vine tomatoes and cook until blistered on a pre-heated char-grill, remove and add the smoked salt, keep hot. Place the hot water in a pot and whisk in the KNORR Jus powder, bring to the boil, while stirring continuously. Reduce heat and allow to simmer for an additional two minutes, add the KNORR Italian Glaze with Balsamic, remove from heat and keep hot. 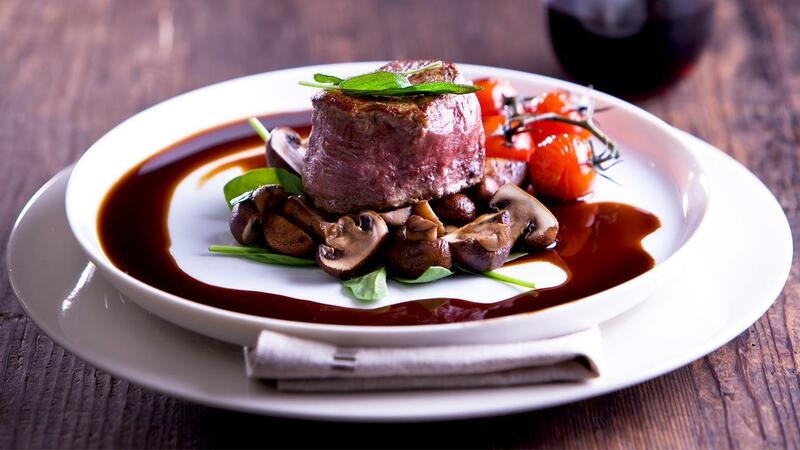 Place the cooked mushrooms, baby spinach, steak and the smoked tomatoes on a plate then drizzle over the balsamic jus, to serve.